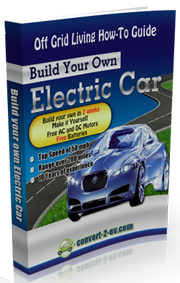 A Do It Yourself (DIY) electric car conversion is usually powered by 96 volts battery and above, preferably 120 or 144 volts DC, which may be enclosed in a single isolated battery enclosure. Although, homemade electric vehicles (EV) using AC controller with an electric motor package can have higher voltage, it will need to have a larger battery bank in order to supply the required electricity. The weight of the bulky battery system has to be distributed along the vehicle for proper balancing of the car. Good load distribution will increase the handling and efficiency of your EV. When the deep cycle batteries on your electric car are located throughout the vehicle, such setup leads the distribution of high power cables all around the vehicle and may have many junctions (which may have heavy duty relays, shunts and fuses to provide safety and control along with a stop at DC controller) in between the batteries and the electric motor. Even the simplest design also requires many connections, which will lead to the possibility of defects or shorts. 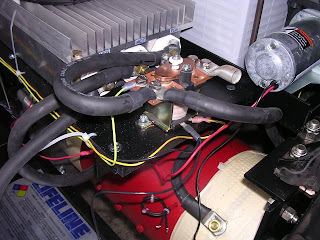 To segregate the high voltage DC from other system of your EV is of prime importance, which also includes AC circuit voltage used for lights and other accessories, although many of us try to save money on this most important aspect by altering the proper system and choose a cheap but hazardous setup. Such system may prove to be a mistake in long run. This situation is very hazardous; not only the concerned battery discharged early but the high voltage running throughout the chassis and electronics system of the car. Worst case scenario of high voltage cables shorting is your EV catching fire! Suppose you have connected all the batteries together, from the first battery to the last one. The positive side connected to the battery and negative side connected to the car’s ground system. Most electric car converters do not realize that chassis of the entire vehicle is now flooded with high voltage current. You can measure the high voltage at the negative connection point. In simple terms, the return path to battery pack from any point of car becomes a high voltage path. To overcome such problem an alternator or DC to DC convertor is used to drive the electric motor so as to charge up the battery. By doing so you will able to isolate the AC circuit system and chassis from the high voltage coming of the battery pack. You can carry out safety check by using a voltmeter anywhere on the chassis or AC circuit system of your DIY electric car. To make the system more reliable and secure, a heavy duty welding cable can be used to run through your EV. The tough cable will be a godsend during adverse condition like heavy rain or accidental collision. Nonetheless, this option does come with a higher price. To avoid abrasion on the cable, the cable can be secured by running a vinyl tube through it from the batteries up to the electric motor and other electronics component. This is a tedious job, but nonetheless, it will increase the safety of your EV. Most importantly, the high voltage cables that run through the driver and passenger compartment should be well insulated, fused and properly labeled. If possible, keep the high voltage cables away from the passenger compartment. For a safe and secured driving in your EV, effective and good high voltage cable design is of utmost importance. I am sold on electric cars. As a matter of fact I have been researchung electric cars for years. I have optioned parts that I have found on the internet including a unique battery that if incorporated in one of todays electric cars will make it perform much better than present day electric cars. The problem is I am no good at putting one together. I need you to find someone that either has an electric car and is willing to sell me his car and alter it to my specifications or let me buy a gas powered car and have him turn it into an electric car of my design. I am quite willing to pay for this. I am completely uninterested in one of those tiny cars that no one wants to ride in. I want a full size car. Pehaps an SUV. Can you find me someone or some car from your membership. I agree that It’s absolutely a bad idea to use cheap but hazardous setups. You may save money by using cheap parts but in the end it will cause loss of investment and personal injuries. If you want to do something yourself you must thoroughly understand everything and talk to other professionals with yrs of experience. I agree to Mike. I have experoenced buying cheap equipment for the sake of saving, but in the end, it is still me who suffered its quality.